The A6M Zero is probably the best-documented airplane utilized by the Japanese in the Second World War. Yet there still remain some details that have not been fully examined. One of these is the canvas cover that served to protect the hydraulic tail wheel retraction system and to prevent dust and debris from getting up into the rear fuselage. This article, therefore, is an attempt to establish just what the appearance of the tail wheel well cover was and offer to the modeler the information needed to replicate this detail. Even a cursory examination of wartime photos shows that this cover was present on virtually every Zero. Yet present illustrations and models have either misinterpreted the appearance of the cover or ignored it completely. The usually well detailed drawings by Shigeru Nohara that are found in the FAOW series, the Green Arrow Illustrated Zero Fighter book and the Aero Detail volume on the Zero, either misdraw the cover or greatly oversimplify it. The makers of the numerous plastic models of the Zero that are available have in turn simply chosen to omit the cover. This is, unfortunately, also the case with the various Zero after-market parts. It appears that both Mitsubishi and Nakajima used the same pattern of tail wheel well cover. This pattern of shroud was made in two parts. The larger piece, which I will call the bag because of its shape, was fairly loose in appearance to allow for the movement of the retracting tail wheel assembly. This bag was permanently riveted to all three sides of the lower lip of the rear tail cone. In turn, the upper sections of two piano hinges were riveted to each lower front side of the bag. The lower parts of the two hinges were attached to each side of the tail wheel strut assembly and a removable hinge pin joined the two halves of each hinge. An additional “U” shaped bracket was bolted to the rear of the tail strut to which the bag was attached by tied laces. When it was desired to remove the tail cone the laces would be untied and the pins of each of the hinges would be removed. The tail cone could then be removed with the bag still attached to its lower lip. Surprisingly, the leading edge of the bag on either side of the tail wheel strut does not appear to have been fastened in place. The photo of the Koga Zero at the top of page 71 of Robert Mikesh’s Zero book shows that the front edge of the bag sloped upward to the tail cone. As well, both the lower photo on page 39 and the upper photo on page 75 of FAOW 56 show a ballooning at the front of the bag such as would result from a lack of any attachment of the front of the bag to the side of the wheel strut. Apparently, the Japanese did not consider this ballooning effect a problem. The second part of the cover was in the form of a canvas flap riveted to the trailing edge of the lower section of the fuselage. This flap was then attached to the front of the tail wheel strut by means of four snaps riveted in line onto a metal strip, which in turn was riveted across the width of front of the tail wheel strut. Here too, this flap had sufficient ease to allow for the retraction of the tail wheel. This resulted in the flap being folded outwards when the tail wheel was lowered. Details of both parts of the cover can be seen in both documentary and photographic sources. The Blayd Corporation, located in Carmen, Manitoba, has been engaged the reconstruction of an A6M2 Zero over the last number of years. An original Mitsubishi A6M2 blueprint (Mitsubishi A6M Blueprint #1220) in their collection clearly shows that the cloth of the bag was riveted to each side and around the rear contour of the tail cone’s wheel well opening. 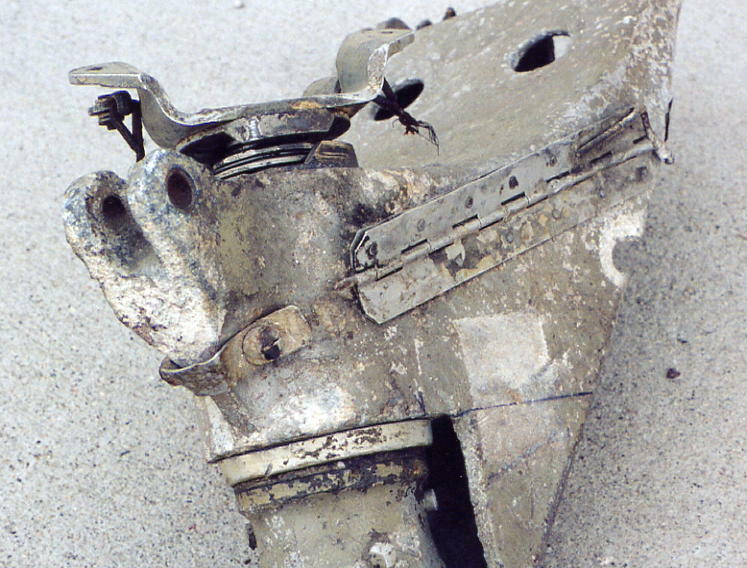 A surviving tail wheel strut, also in the Blayd collection, illustrates both the lower hinge attachment, the location of the snaps, and the “U” shaped attachment point at the rear of the tail strut. (Ill. 1, Ill. 2) The laces that were used to attach the bag to the “U” shaped fitting can be seen hanging down in this location in the photo on page 64 of FAOW 55, the lower photo on page 31 of FAOW 56, and the upper photo on page 81 of MA 510. Several other photos are also of interest. 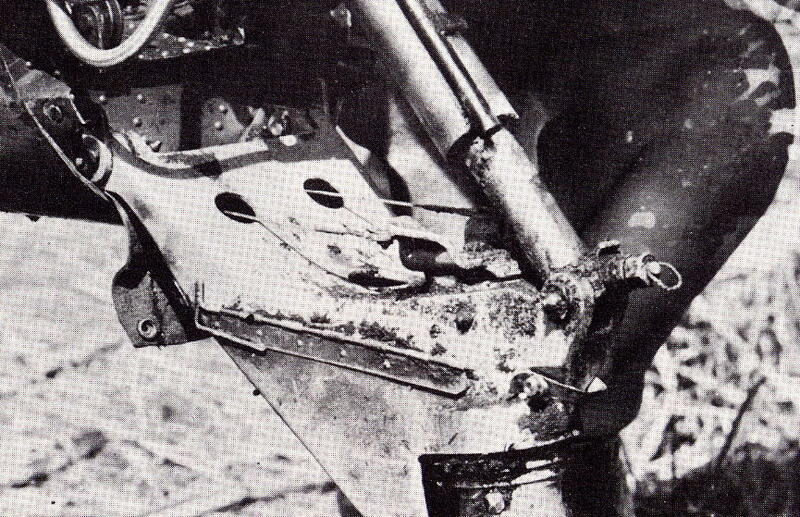 Photos 164 and 165 on page 33 of Aero Detail 7, Mitsubishi A6M Zero Fighter plainly illustrate the details of the tail wheel shroud mounting hardware. On page 43 of FAOW 56 the picture of Mitsubishi-built A6M5 81-162 (s/n 4175) shows the small front flap hanging down in front of the tail wheel strut. Page 48 of the same source seems to show a similar feature on Nakajima-built A6M5 61-131 (s/n 4361). The same feature can be seen on page 51 of FAOW 56 on Nakajima-built A6M5 8-36 (s/n 5356). There exists, however, an anomaly in this reconstruction. The Mitsubishi-built A6M5 (s/n 4340) in the National Air and Space Museum exhibits a somewhat different pattern of a tail wheel shroud. The front flap has been done away with and instead the forward end of the bag section has had two side flaps added to it. These curve around the front side of the tail wheel strut and are fastened with eight snaps, four on either side of the two flap extensions. It appears that four of these snaps are attached to the trailing edge of the rear fuselage and the other four are affixed to the tail wheel strut. Two published views of this shroud can be found on page 179 of the Green Arrow book Illustrated Zero Fighter or on page 34 of Aero Detail 7. But note that this pattern of shroud can only be seen on this particular aircraft. A photo, probably taken in the early 1945, of the NASM Zero on page 33 of the March 1977 issue of Airpower magazine can be interpreted as showing this airplane with the pattern of cover as found in all other of the cited examples. It is therefore very possible that this shroud was a NASM fabrication, probably because of a lack of adequate references at the time. A reconstruction of how the tail wheel well cover appeared is presented in Illustration 4. Unfortunately, as far as can be determined, no original shrouds are known to exist. As well, existing modern reconstructions of the shrouds have used either tan coloured canvas, as seen on the NASM A6M5, or olive drab coloured canvas, as installed on the A6M7 in the San Diego Aero Space Museum, but the validity of these shades cannot be confirmed. Other restored Zeros in the collections of museums in both North America and Japan do not show any evidence of having any cover refitted to the tail wheel assembly. The one mention of the cover that gives some indication of its outward appearance is in the article Lt. Cmdr. C. T. Booth wrote for Air Progress in September 1943. He tells about making his initial inspection of the Koga Zero and mentions that "The retractable tail wheel was all bound about with greased-soaked canvas, presumably to seal the fuselage against entry of carbon monoxide." The modeler is thus left with the problem of trying to duplicate this cover. In smaller scales such as 1/72nd and 1/48th the best approach may be to make the bag out of putty and the flap out of thin sheet plastic. Details such as the hinges can then be added with plastic strips and the laces replicated with wire. Larger scales, and here the new 1/32nd scale A6M5 by Tamiya comes to mind, may necessitate the use of a thin pliable material to recreate the bag and flap. In their line of after-market photo-etched details for this kit Eduard (Set 32 065) provides the two side hinges that are attached to either side of the tail wheel strut. CMK (Set 5001) in turn offers an entirely new replacement tail wheel strut and rear fuselage tail cone but does not address the matter of the wheel well cover at all. Lastly, for those who wish to retain the folding landing gear function of the Tamiya kit all I can do is wish them luck. The tail wheel well cover is admittedly but a minor detail. Nevertheless it is hoped that the information related here will be of some use in working towards that elusive goal of getting an exact picture of the appearance of one of the great aircraft of the Second World War. Illustration 1. Side View of the Tail Wheel Strut. 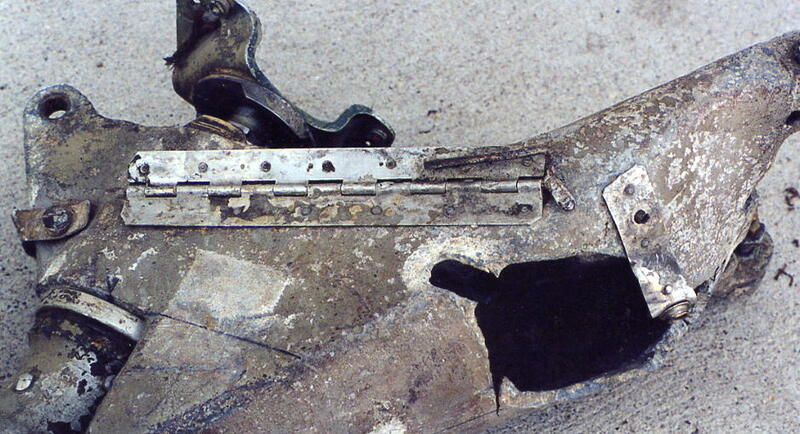 On the front of the strut is one remaining metal snap which fastened the front flap to the strut. On the side of the strut is the hinge to which the bag was attached. Bolted to the back of the strut is the “U” shaped fitting to which the bag was tied. Illustration 2. Rear View of Tail Wheel Strut. The “U” shaped fitting to which the bag was tied is clearly shown. Illustration 3. Tail Wheel Strut from a Buna A6M3. This photo shows the way the front flap was attached to the fuselage and one of the snaps that held it on to the tail wheel strut. The hinge and “U” shaped fitting are also visible. Illustration 4. Reconstruction of the Tail Wheel Well Shroud. The way the bag hangs down is a commonly observed feature in a number of photos. Also note that the exact placement of the tied laces around the “U” shaped fitting is somewhat conjectural.